Discover this local event and meetings gem on Austin&apos;s historic Sixth Street. Set in an 1861 turn-of-the-century building, locals know Buffalo Billiards as Sixth Street&apos;s best downtown pool hall with daily drink specials, tournaments and amazing food. Meeting and event planners are invited to take advantage of this 22,000-square-foot downtown venue&apos;s party spaces, accommodating groups of 10 to 1,000. Buffalo Billiard&apos;s experienced Event Manager will work with you to create an unforgettable experience and the in-house Executive Chef can design an array of dishes to satisfy all budgets and tastes. Download the Buffet Menu and the Appetizer Menu to view the full lineup of delicious catering options. Experience rustic mountain ambiance and fantastic views of Sixth Street in the Lodge. Guests enjoy seven private full-size pool tables, two dart boards, a shuffleboard table, five HDTVs, and a big-screen projector. This room also includes a stage-perfect for presentations and other kinds of entertainment. Capacity: Up to 250 people. The Rec Room is a gamer&apos;s paradise accompanied by a full bar. With a mix of retro and modern technology, the Rec Room is perfect for corporate happy hours, interactive birthday parties and other celebrations. 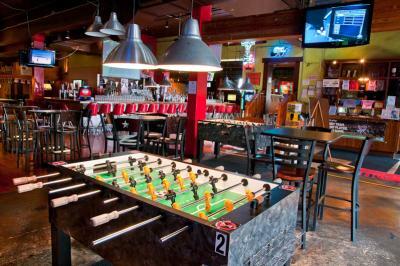 This adult playground has two pool tables, air hockey, multiple arcade games, Nintendo Wii, PS3, XBOX360 and more. A private balcony overlooking historic Sixth Street completes the fun. Capacity: Up to 110 people. This semi-private area has five pool tables, shuffleboard and really comfortable couches. It&apos;s perfect for after-work get-togethers, parties or simply relaxing with friends. Capacity: Up to 60 people. Offering a bird&apos;s-eye-view of the main floor, The Loft is ideal for a small gathering and includes 10 pinball machines, one shuffleboard table, a flat screen and various seating areas. Capacity: Up to 25 people. For more information on how to reserve your next event, contact Buffalo Billiards at 512-479-7665 or visit buffalobilliardsaustin.com/private-parties.